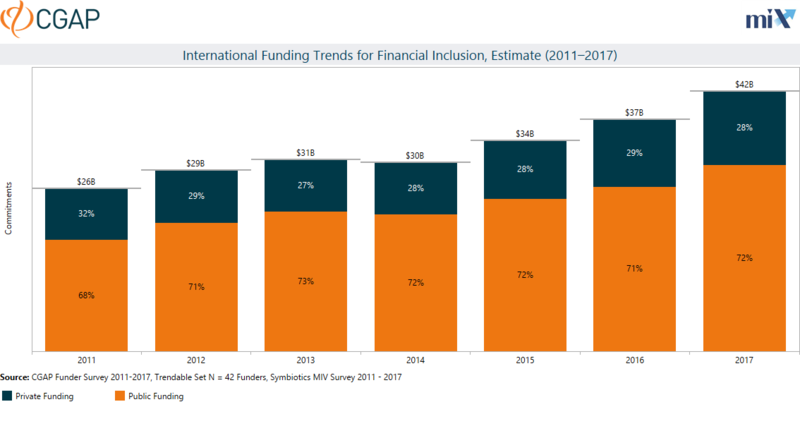 How much international funding is going to support financial inclusion? 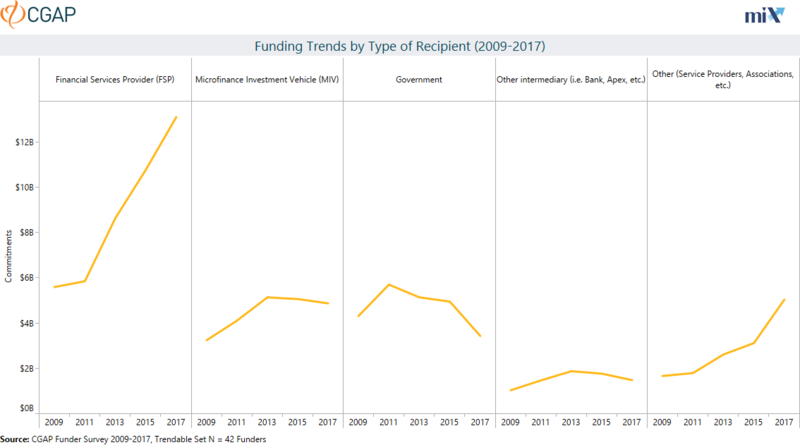 For more information about international funding for financial inclusion at the country level, download the Excel spreadsheet, click here. Only countries with at least two active funders, two active projects and US$5 million in active commitments are included in the list. 1. How much international funding is going to support financial inclusion? 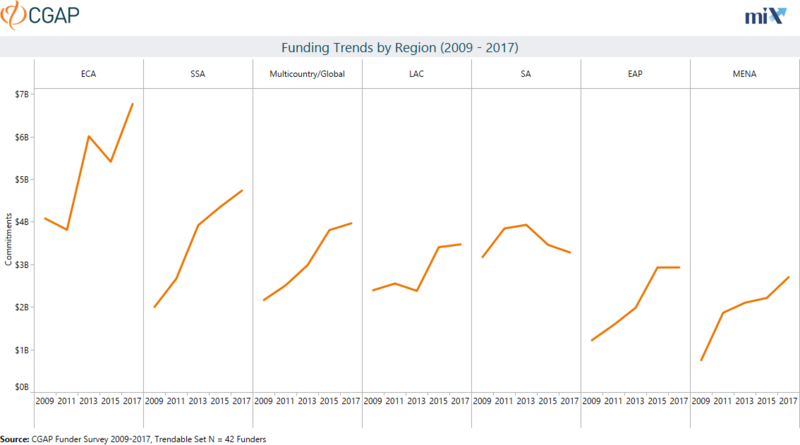 The CGAP Cross-Border Funder Survey, implemented in partnership with MIX, is conducted annually and alternates between surveying the full set (50-plus) of funders and a smaller set (20-plus) of the largest funders worldwide, representing about 73 percent of the total funding commitments. 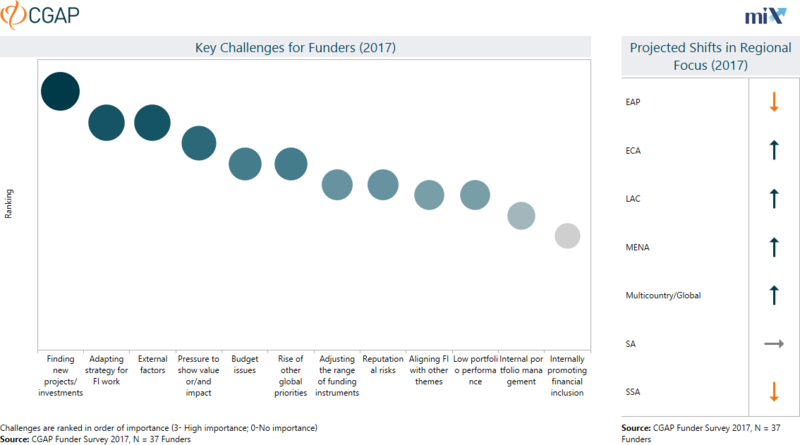 In the years when the smaller set is surveyed, the total funding estimates include the commitments of other funders carried over from the previous year. 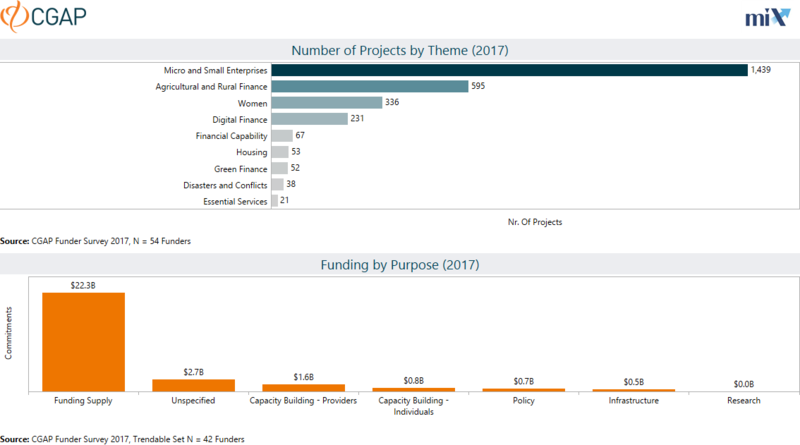 For this year’s survey of 2017 data, CGAP collected data from 54 international funders, both public and private. Public funders include development finance institutions and bilateral and multilateral development/aid agencies. Private funders include foundations, private donors and investors, and microfinance investment vehicles’ assets originating from high net worth individuals and other institutional investors. The survey covers funding commitments at the end of each year for projects aimed at advancing financial inclusion either directly or indirectly, as part of broader development projects, including micro and small enterprises, digital finance, women, and youth (among many others). Funders are asked to report the commitments that are explicitly focused on financial inclusion, which is sometimes hard to establish. Therefore, the funding estimate should be considered the minimum level of commitments for this purpose. The total funding estimate is calculated by combining data from the survey respondents and publicly available data from the Symbiotics MIV Survey (www.syminvest.com), removing double counting and adjusting for the full universe of international funders, where possible. For 2017 data, the volume of public funding commitments was adjusted by 3 p.p., and that of the private funding by 4 p.p. 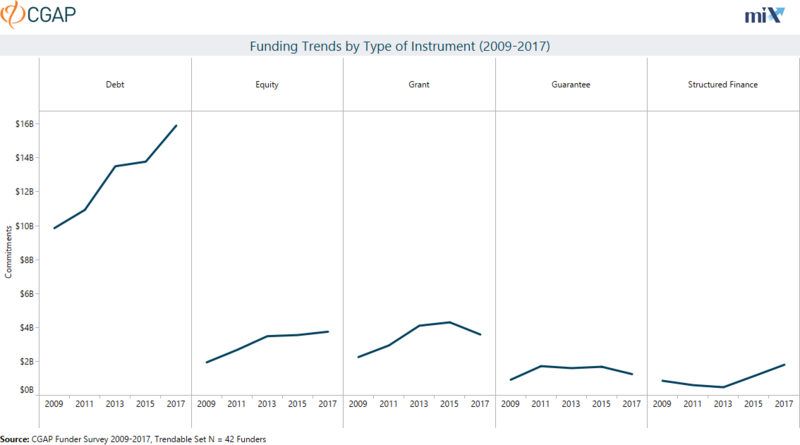 Multi-year trends are based on the data of 42 funders who have reported bi-annually since 2009. The trendable set of funders accounts for 70 percent of the total estimated funding for financial inclusion. For more details on data collections see the survey Guidance.